Stuttgarter Kunstkabinett Roman Norbert Ketterer, Stuttgart (acquired from the above, 1959). Anon. sale, Karl & Faber, Munich, 29 November 1979, lot 1597. Private collection, Germany (acquired from the above, by 1987). Acquired from the above by the present owner, March 2003. Kirchner Archive, vol. III, no. 161, fig. 659 (earlier state of the painting illustrated; dated 1919). W. Grohmann, E.L Kirchner, New York, 1961, p. 98 (illustrated in color; illustrated again, p. 148). D.E. Gordon, Ernst Ludwig Kirchner, Cambridge, 1968, p. 362, no. 659 (illustrated). H. Guratzsh et al., Farbe, Form, Zeichen: Sammlung Piepenbrock, exh. cat., Stiftung Schleswig-Holsteinische Landesmuseum Schloss Gottorf, Heidelberg, 2002, p. 138 (illustrated; illustrated again in color, pl. 20). Kunstmuseum St. Gallen, Ernst Ludwig Kirchner: Werke aus dem Nachlass, 1950, no. 54. Kunsthalle Bremen; Kunstverein Hannover; The Hague, Gemeentemuseum; Cologne, Wallraf-Richartz-Museum and Kunsthaus Zürich, Meisterwerke des deutschen Expressionismus, March 1960-June 1961, no. 41 (illustrated in color, pl. 26). Ernst Ludwig Kirchner's Tangotee depicts a throng dancing. The various couples are spread across the canvas, creating a pictorial rhythm that echoes the music implied by the theme. Their figures are thrust into bold relief by the geometry of the backdrop, against which the movements of their bodies become accentuated. This picture was dated 1919, although it appears to have been subject to subsequent re-touching over the next couple of years, as was often the case with Kirchner's works, especially during his time in Switzerland, following the end of the First World War. Tangotee is one of a small group of Kirchner's pictures depicting people dancing, which appears to date from the period between the end of the 1910s and beginning of the 1920s. During this time, Kirchner experienced a surge of creativity, having recovered from a recent nervous breakdown and morphine addiction. 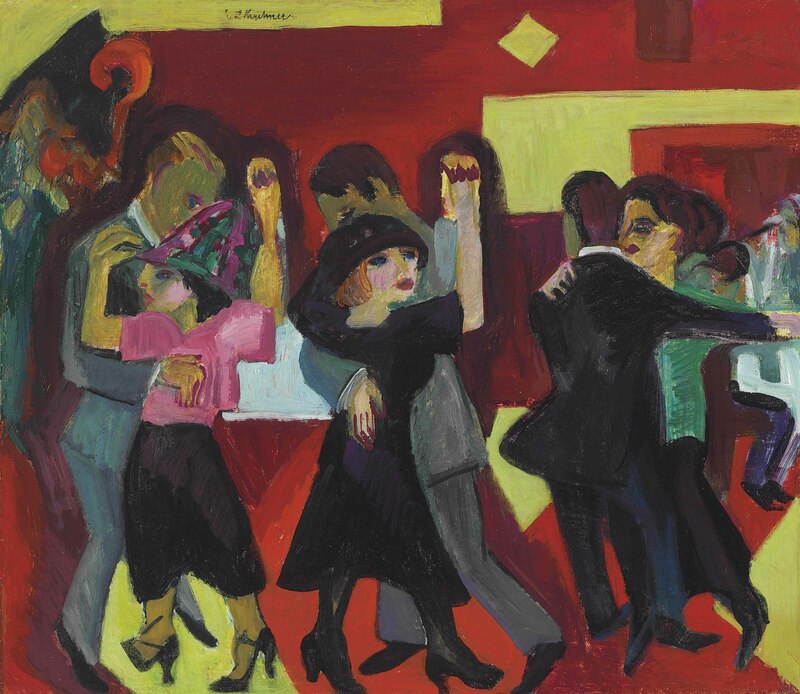 The present work alongside two others illustrating peasants dancing, Tangotee Bauern am Abend and Bauerntanz, which Kirchner himself defaced with paint over a period of years, reveal some of the exuberance with which the artist launched himself at painting. Through painting, Kirchner regained some manner of equilibrium. Despite this sense of equilibrium, a frenetic energy is still expressed in Tangotee. The mask-like faces of the men, the darkened silhouettes of the dancers, and the angularity of the geometric pattern convey some of the fervour and angst of Kirchner's Expressionism, which had reached its apogee in recent years, not least during the course of the First World War. Kirchner did not serve on the front lines--as an artist, he had been placed, without his knowledge, in a "softer" situation at a cavalry training camp. Nonetheless, he was deeply affected by the inhumanity of the War, not least because of the deaths of his friends and fellow artists. His abstraction of the conflict was utterly shattered by the grim finality of their ends, and Kirchner worried that a similar fate awaited him. A nervous collapse led to his confinement and treatment; ultimately, he would return to art in part as a form of therapy. Having settled in Davos in 1917, Kirchner gradually began to recover and, around 1919, immersed himself in his painting, print-making and drawing with gusto. He was inspired by the mountain scenery in which he was immersed at Frauenkirch, near Davos, and by the lives of the locals whom he immortalized and celebrated in pictures such as Tangotee. The theme of the dance had long featured in Kirchner's work. In Switzerland, it came to the fore once more in pictures such as Tangotee, reflecting a range of issues. On the one hand, Kirchner was traumatized by the contrast between Berlin, a cosmopolitan city deeply affected by the war, and his new sanctuary: "people are half mad there [in Berlin]. Amidst machine-gun fire and invasions they are partying and dancing... How eternally happy I am for all that to be here, and to receive only the last splashes of the waves of outside life through the mail" (quoted in D.E. Gordon, op. cit., p. 116). At the same time, Kirchner was also impressed by the enthusiasm of the locals in Frauenkirch when they were given a chance to dance; later, he would also show an increasing fascination for the "Tango Teas" in Davos itself. It may have been with this in mind that, in 1919, Kirchner created a frieze of the Tanz zwischen den Frauen, revisiting a theme that had featured in his 1915 painting of the same name, now in the Pinakothek der Moderne, Munich (fig. 1). Kirchner created this new version of his frieze with folkish spirit upon a thick wooden kitchen door. On the other side of the door was an Alpine progression, revealing the importance of Kirchner's surroundings to his art. The figures in the frieze have a squat character, more in keeping with Tangotee than the elongated figures that often featured in Kirchner's pictures from before the First World War, revealing a continuity of his new idiom. "Because of the gramophone, we have had a lot of visitors these last few days. There has been dancing. These children of nature are intoxicated by modern dance music. There will be interesting things for me to sketch" (quoted at www.kirchnermuseum.ch). In fact, a photograph exists depicting couples dancing amongst Kirchner's paintings at "In den Lärchen," with the artist himself watching on. Perhaps, the frieze Tanz zwischen den Frauen suggested the revival of the theme of the dance in Kirchner's work. Yet, in looking at Tangotee, there is a vivid sense of the anecdotal rather than the mere allegorical: this is not just a symbolic dance, but one which the painter himself witnessed and experienced. "My work comes from the longing of loneliness: I was alone and the more I came among people the more I felt my loneliness" (quoted in Gordon, op. cit., p. 28). The theme of dance had already featured in his earlier works, for instance his Czardastänzerinnen of 1907, now in the Gemeentemuseum, The Hague (fig. 2). Indeed, Czardastänzerinnen's sense of rhythm and three prominent figures in the foreground share an undeniable sense of energy and composition with Tangotee. During the late 1910s and early 1920s, the period when Tangotee was painted, Kirchner found himself looking with an increasingly retrospective attitude at his own work, not least when boxes of ephemera, such as old pictures and documents were delivered to his new home in Frauenkirch. This gave him the ability to inspect and even edit his older works, for instance Czardastänzerinnen itself, which he revisited in 1920, essentially bringing it into a new state, a process he often exercised with his works, including Tangotee. This process reflected the incredibly intense relationship that Kirchner maintained with his older works. As well as "improving" classic Expressionist compositions such as Czardastänzerinnen, he was looking at the totality of his oeuvre from the new perspective of Davos, from his life amongst the peasants and the pastoral landscapes. Kirchner's reflections brought about new interrelationships between themes and pictures, reinvigorating his artistic production in Switzerland and creating a greater sense of continuity in his work.